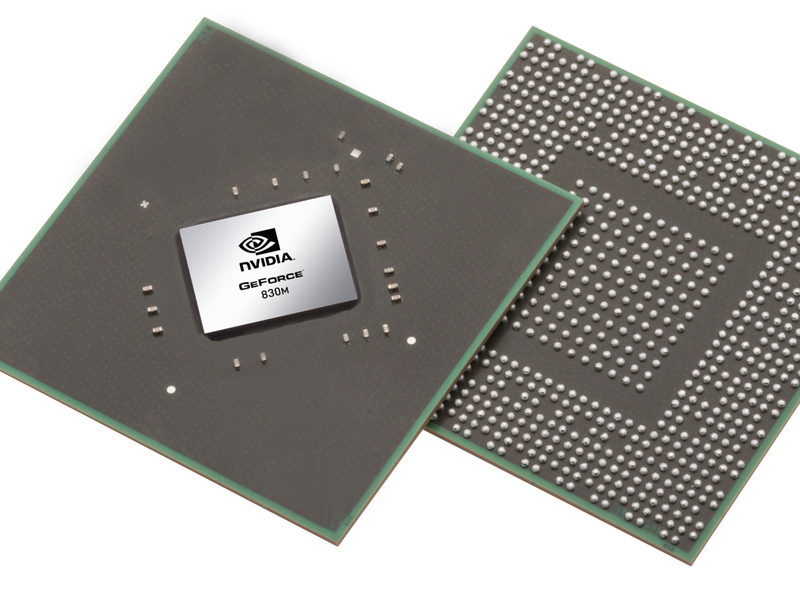 The NVIDIA GeForce 830M is a (lower) mid-range, DirectX 12-compatible graphics card for laptops unveiled in March 2014. It is one of the first cards based on Nvidia's new Maxwell architecture (GM108 chip), but is still manufactured in 28 nm. The 830M offers 256 shader units clocked at 1029 MHz (+ Boost) as well as 2 GB of DDR3 memory (64 bit, 2000 MHz effective). Compared to Kepler, Maxwell has been optimized in several details to increase power efficiency. Smaller Streaming Multiprocessors (SMM) with only 128 ALUs (Kepler: 192) and an optimized scheduler should lead to better utilization of the shaders. Nvidia promises that a Maxwell SMM with 128 ALUs can offer 90 percent of the performance of a Kepler SMX with 192 ALUs. The 830M features a partially deactivated GM108 with just 2 out of 3 SMMs (256 shader cores, 16 TMUs, 8 ROPs, 64-bit interface). Similar to GM107, the GM108 supports DirectX 12 (Feature Level 11_0 only). According to Nvidia, the GeForce 830M is about 25 percent faster than the old GT 730M. Practically, the advantage is a bit smaller and the performance similiar to the old GeForce GT 740M (about 20 percent below the GeForce 840M). Many games of 2013/2014 will run fluently in WXGA resolution (1366 x 768) and medium detail settings. However, very demanding games such as Crysis 3 or Battlefield 4 will require even lower resolutions and/or details. The power consumption of the GeForce 830M should be about 25 Watts or less. Therefore, the 830M is best suited for laptops 13 inches in size or larger. The 800M series also supports Optimus to automatically switch between an integrated graphics card and the Nvidia GPU.